Ugh. You'd think by now I would have made my peace with the concept of weaving in ends on knitting projects. 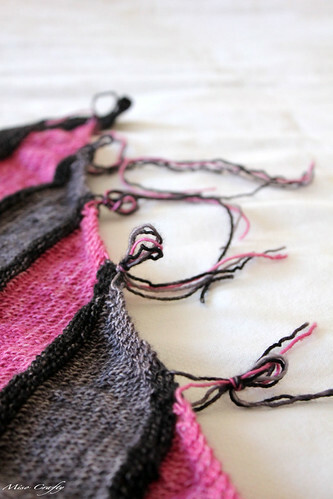 I've dedicated this entire weekend to weaving in all the ends for the Mystery shawl. It may not look like a lot to some of you but for someone who dislikes this part of the knitting process, this is a ton! If I was smart I would have woven in the ends as I went along, instead of telling myself that I would do them later. Well, now it's later and I still haven't done jack about them. So excuse me if I disappear for a while. If you don't hear from me by the end of the week, it's cause I died from having to weave in a million ends! Blah! I'll try...we'll see if I can get this bad boy blocked first! I hate these ends too - not a big fan of the intarsia. I am ignoring most of my ends until I'm finally finished!